Act on news about your contacts with timely touches. 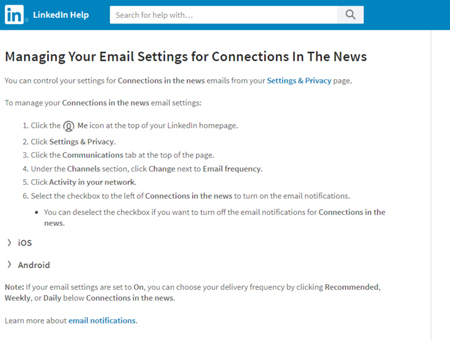 LinkedIn provides a free service, Connections in the News, which collates and sends you links to articles about your connections. 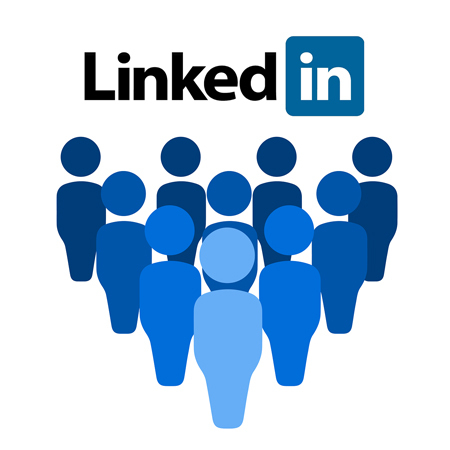 With a quick click, you can instantly react with an appropriate remark, either through the LinkedIn platform or not. 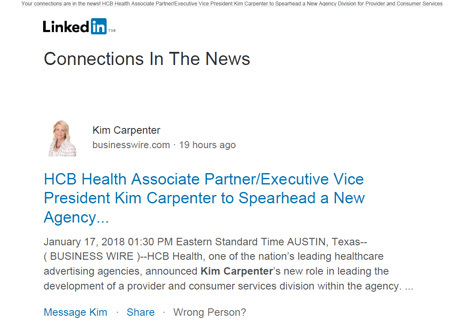 It’s like Google Alerts for your LinkedIn network. We all get tired of the constant parade of hard-sell emails. Find inspiration in the following five points to jumpstart your company’s personalized, lead-nurturing messages. Seize each opportunity to open a door a little wider. Refer to the new story that initiated the communication and then take it further with a call to action. Find out about mergers, new acquisitions and initiatives, and new responsibilities that create new chances to open or rekindle discussions. Take the process further to cheer colleagues, recruit new team members or ask for introductions that could lead to meaningful relationships. 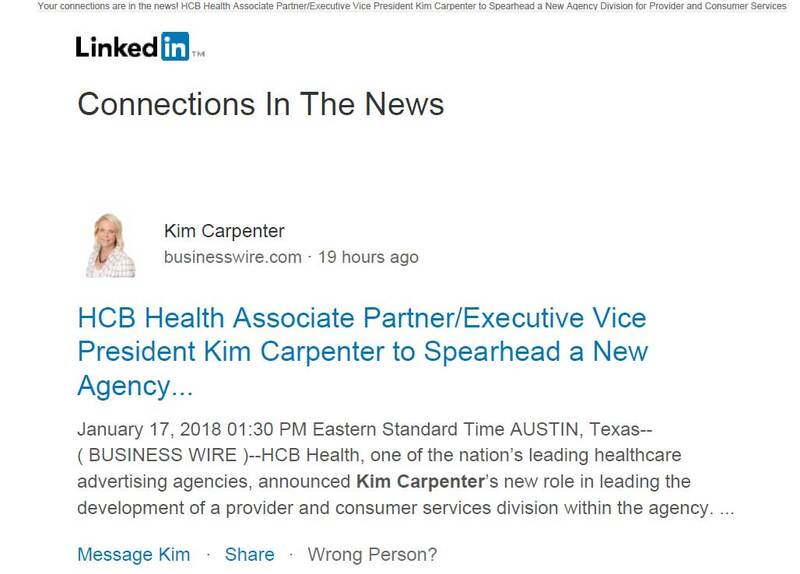 The example below of a Connections in the News email I received the day after a press release published a story about a former coworker, Kim Carpenter, gave me the opportunity to send a note right away and praise her hard work. Note the Message Kim link that I could use to dash off a quick reaction right there and then. Encourage your marketing and sales management staff to start adding more soft-sell, lead-nurturing messages as things happen. Follow these instructions to sign up for your LinkedIn Connections in the News and get started now. Keeping current is free and fast. Want to learn more about lead nurturing? Schedule a call with our team to learn how we tackle multi-touch, multichannel programs–what we call “Meeting Maker” Campaigns. We’re glad to help you determine how many qualified leads you need to meet revenue with our free Reverse Sales and Lead Funnel calculation. For more resources, peruse our Meeting Maker campaign case studies. Download our Why It Takes 7-13+ Touches to Deliver a Qualified B2B Sales Lead Today white paper. Whatever you do, consistently keep the touches coming and certainly don’t give up after the first handful. You’ll be glad you did. By Jan Carroza, VP of Business Development and Account Management, Beasley Direct and Online Marketing, Inc.